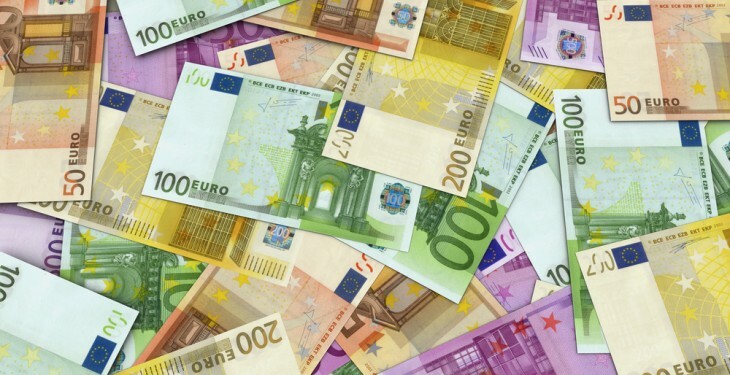 A county-by-county breakdown of the payments completed under GLAS and AEOS has been released by the Minister for Agriculture, Food and the Marine, Michael Creed. Minister Creed released the information in response to a number of questions from Fianna Fail’s Agriculture Spokesperson Charlie McConalogue. 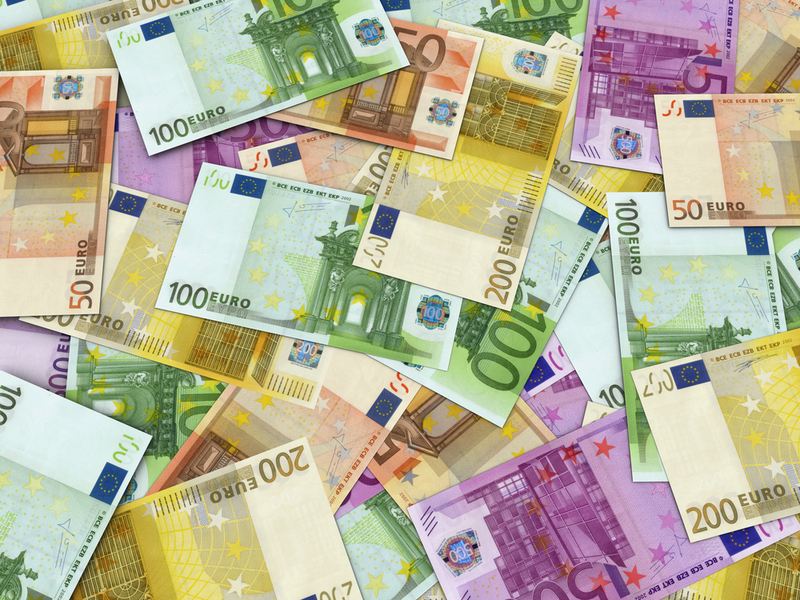 GLAS payments totalling €114,179,553 have been issued to date, according to Minister Creed. The table below shows the number of applicants, in receipt of GLAS 1 and GLAS 2, who have received 85% of their total 2016 payment. It also highlights the number of applicants who have passed all pre-payment validations (PPV) and are awaiting their 2016 payment, as well as the number of applicants yet to receive a payment. In total, close to 87% of payments have been processed by the Department and sent to recipients, these figures show. This percentage remains relatively unchanged when you look at the number of applicants paid under GLAS 1 and GLAS 2 individually. Applicants from counties Galway and Mayo account for close to 19% of the total number of applications to both GLAS 1 and GLAS 2. 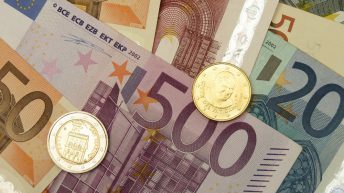 A payment rate of close to 85% has been achieved to date in both of these counties, which had a combined total of 6,943 recipients. Meanwhile, Deputy McConalogue also asked Minister Creed to confirm the total number of persons that applied for AEOS (Agri-Environment Options Scheme) that have received their total 2016 payment. Similar to his GLAS query, Deputy McConalogue asked for a breakdown of the number of AEOS recipients yet to receive a payment. AEOS II participants completed their 5-year contracts on December 31, 2016, according to Minister Creed. 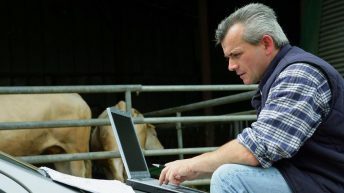 “Under the EU regulations governing this scheme and all other area-based payment schemes, a full check, including cross-checks with the Land Parcel Identification System, must take place before payment can issue. As all AEOS II participants will be receiving their final payments under the scheme, re-checks on payments made for all scheme years must be completed before final payment can be processed. “All cases cleared for payment are paid on a weekly basis,” he added. In total, just over 81% of the total number of applications have received their full payment. 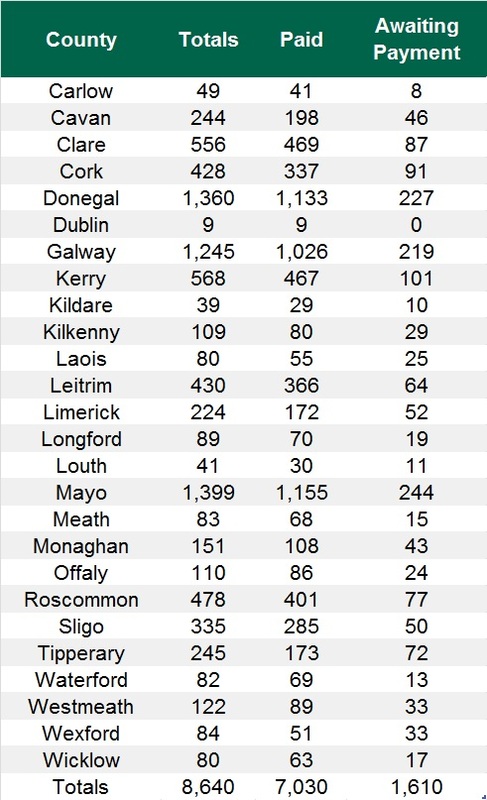 Applicants from counties Donegal, Mayo and Galway account for 46% (4,004 applicants) of the total number of AEOS recipients. 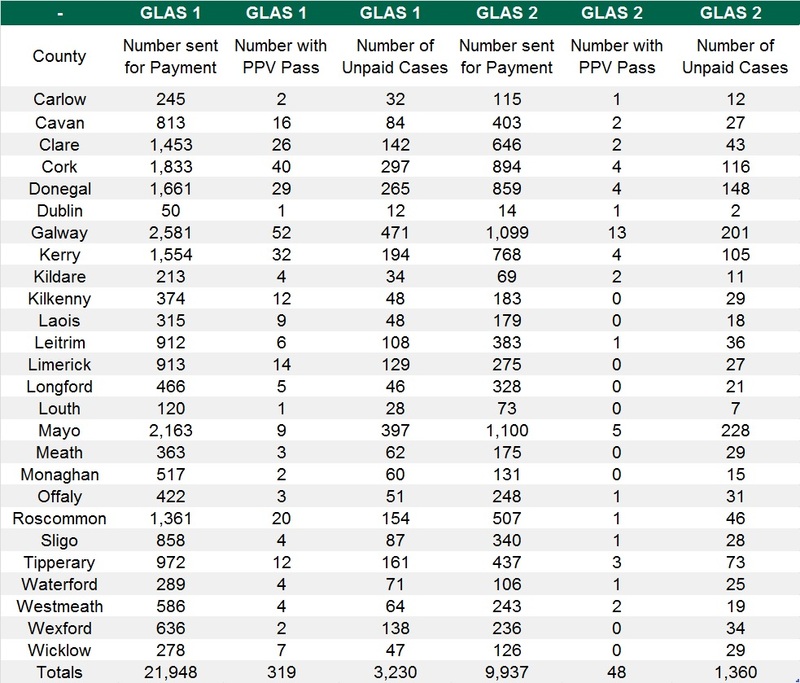 The number of applicants from these three counties, who have yet to receive payments, account for close to 43% of the total number of recipients still awaiting a payment.